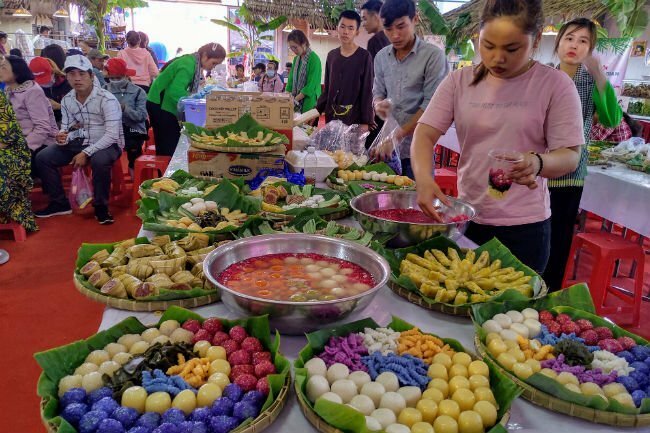 The eighth Southern Folk Cakes Festival is being held in the Mekong Delta city of Can Tho, with eight main activities which visitors should not miss and more than 220 booths introducing nearly 100 types of southern traditional cakes. Nguyen Khanh Tung, director of the Can Tho Promotion Agency (CPA), the organizer of the festival, said that under the theme “Taste of the Southern Region,” the annual event is aimed at preserving the traditional sweets of southern Vietnam and help local cake makers and domestic and foreign businesses build links. Eighty-four cake makers are joining a competition to make 64 types of traditional cakes. The contest is intended to honor cake artisans and their skills, preserve the tradition of making cakes, and allows visitors to learn more about the southern food culture. Cake makers are demonstrating how to make different types of cakes such as banh phong, banh tam, banh bo com ruou, banh gan, banh la, and banh tet la cam. Visitors can directly join in the cake making process and try using traditional cake making tools. The festival showcases more than 15 types of southern sweet soup and drinks and introduces how to make them. There are also many exciting games themed around southern sweet soup with valuable gifts for winners. The Can Tho City Department of Education and Training is organizing a number of activities for students to learn how to make traditional cakes, help them understand more the traditional food of the southern region. Artisans from Sa Dec cake flour village in Dong Thap Province are presenting cake flour products made from rice and local specialties like banh phong tom (prawn crackers). Vietnam Consulting Group (VCG) from HCMC is offering a southern folk cake buffet featuring nearly 100 types of traditional cakes in a southern countryside setting. According to Doan Huu Duc, general director of VCG, the buffet area is capable of serving 200 guests at a time. A show of ao ba ba (traditional shirt of southern people) will be held this evening, April 13, showcasing 100 ao ba ba with different styles from the past to present. Visitors are encouraged to wear ao ba ba when taking part in the festival. A seminar titled “New markets for local sweet foods” will be jointly held by the Saigon Times Group and CPA on April 16 to explore ways to find markets for traditional cakes and improve incomes of cake artisans. In addition, CPA arranges tours to Phong Dien District, which is 15 kilometers from the city’s Ninh Kieu Wharf. Guests will visit ecotourism sites in the district and learn about local specialties and culture during the journey.